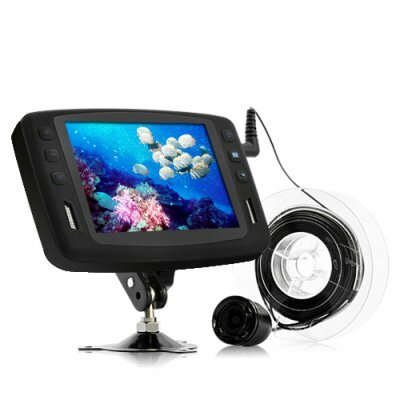 Successfully Added Underwater Fishing and Inspection Camera with 3.5 inch Color Monitor to your Shopping Cart. Tired of dropping bait in hot fishing spots that are all fished out? Bring along this handy Underwater Fishing and Inspection Camera with 3.5 inch Color Monitor on your next trip! No more guess work or long waiting periods with no action. Now, spend your time bringing in more fish than ever! This underwater fishing and inspection camera comes with a completely waterproof IR camera that penetrates the dingy water and finds fish where they hide. Everything the camera sees will then display on the 3.5 inch crystal clear color monitor. You will see clearly what’s down there and fish at the right water! In fact this underwater camera is not just for fishing. With a 15 meter long camera cable that enables it to reach into deep waters, this product is also suitable for university students, environmental activists to study underwater creatures, landscapes, boat owners to check out their props, or for anyone who enjoys the fun of exploring the underwater world. Practical and easy to use, this cool new product is now in stock for immediate shipment worldwide. Add to cart now and your order gets shipped within a day! Brought to you by your reliable source for high tech fishing gadgets, Chinavasion! This fun gadget will be something the kids fight for on your next fishing trip. So buy one for each of them! Extremely easy to use. Just hook up the camera with the monitor, and then drop the camera into the water. You will then be able to see the underwater world clearly.